Restaurant Arles ("Arles') is a neo-bistro situated in the De Pijp area in Amsterdam, and is owned by hospitality concept developer Ronald Huiskamp and Bob Hamersma, son of renowned Dutch wine writer Harold Hamersma. Huiskamp was recently also involved as concept developer/consultant in the (re)launch of The White Room at the Krasnapolsky Hotel (three-star chef Jacob Jan Boerma's second restaurant) and Michelin starred Vermeer, both located in Amsterdam. Arles has a small kitchen team of three, with chef Numa Muller (b.1985 in Arles) at the helm. Arles is open for dinner Tuesday through Saturday, and it offers a set menu for €34 with a small selection of starters, mains and desserts. An extra cheese course is available for around €4 per piece. I had dinner with my husband at Arles in March 2017 and we both ordered four courses from the set menu plus and extra cheese course. 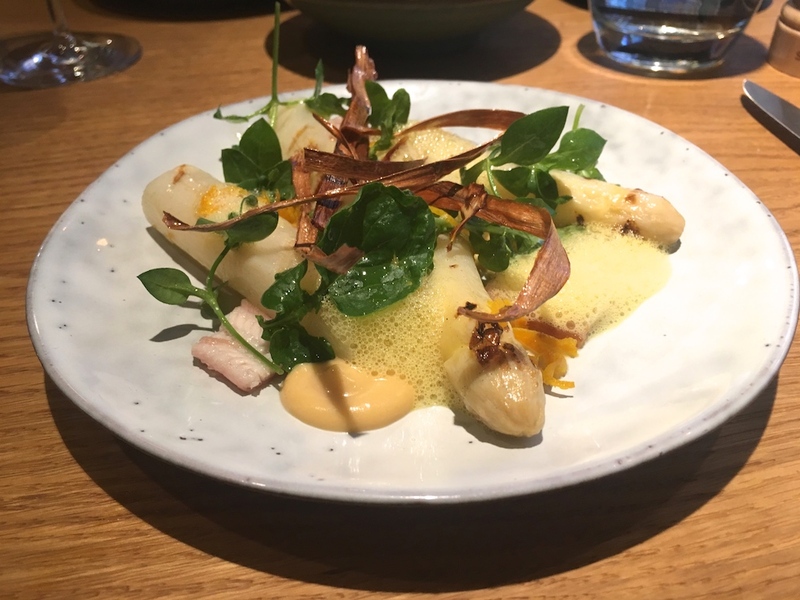 Dinner started with an enjoyable dish of juicy white asparagus (cooked and then flash-grilled), a few small pieces of smoked eel, a smooth orange and eel emulsion, some orange zest, orange foam, and deep-fried strips of white asparagus. White aspargus and orange is a lovely flavour pairing, but you rarely see on it on restaurant menus these days, so I was glad to spot it on the menu at Arles. The asparagus were well-cooked, with its natural bitters coming through nicely and their bitterness was slightly enhanced by the orange, which was lovely. The smoked eel delivered an attractive fattiness, but unfortunately there was not quite enough of it, so in the end the eel (literally) got lost in the dish. 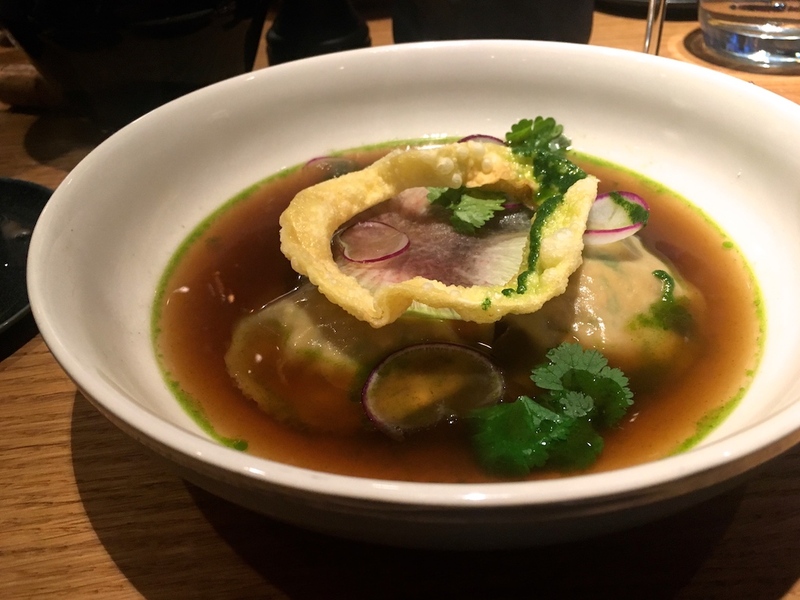 Equally enjoyable were wontons, with a filling of minced chuck steak, ginger and chopped pine nuts, served in a delicious vegetable broth seasoned with soy sauce, ginger and coriander, and garnished with a deep-fried wonton pastry ring. For the main course I had happily opted for pork belly, which turned out to be a huge disappointment. First of all it was a poorly chosen piece of pork belly with an unbalanced fat/meat ratio. Since it's a natural product, the fat to meat ratio of pork belly can vary a lot and some breeds, like the Mangalitsa pig, tend have a thicker layer of fat than others (perfect for lardo). 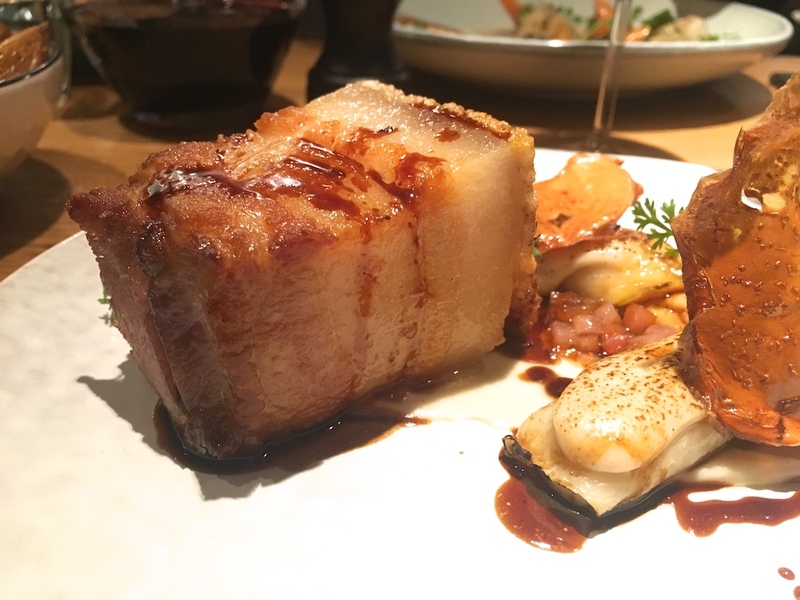 Not all pork bellies are suitable for a dish like this. Secondly, the pork belly was badly prepped and cooked, both the skin and fat were inedible. Good pork fat can be a real treat, but here the fat hadn't rendered enough, leaving a big lump of rubbery fat. The skin hadn't crisped up and was tough and chewy, and it still had hair on it, which is just laziness. No chef worth his salt would have sat down and eaten this. The only good thing about this dish was the creamy celeriac and apple garnish. The menu tonight offered a choice of three cheeses: Beaufort d'été (€5), Chaource (€4) or Fourme d'Ambert (€3.50). We had the Chaource and the Beaufort d'été, which were both lovely. 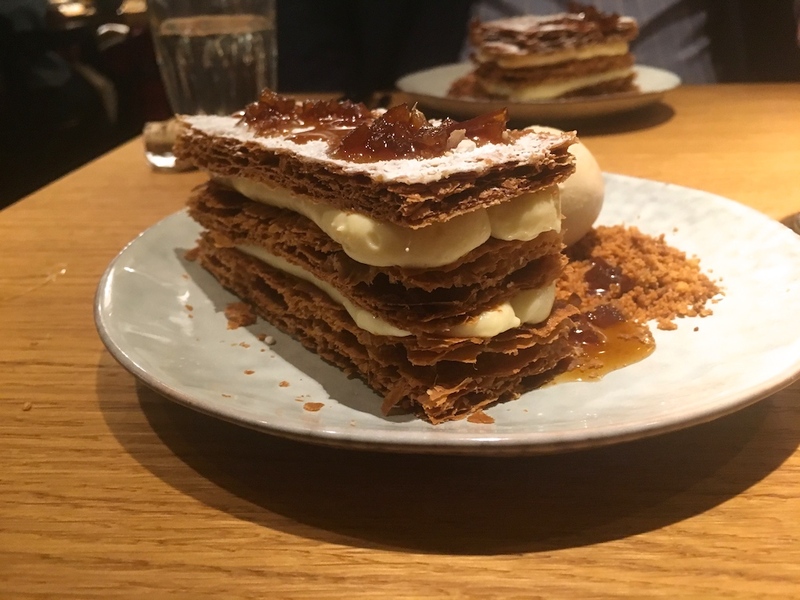 For dessert I had a mille-feuille with parsnip-flavoured pastry cream, parsnip ice cream, and a parsnip and maple syrup confit. A pretty looking dessert, but I found the pastry a tad on the dry side and the pastry cream didn't have enough creaminess/richness to make up for this. Overall the flavours were nice but the parnsip flavours in the ice cream were nondescript. It's clear to see why many locals are attracted to Arles, as it's a charming restaurant with a relaxed atmosphere, affordable food and a well-chosen, sensibly priced wine list. The food today was a bit hit and miss, with a train wreck of a main course (which was compensated in the bill), but luckily the friendly and very attentive service more than made up for that. I did like the concept of the dishes and I applaud that chef Numa Muller is trying to keep things simple at Arles. There's already enough misplaced fussiness around. That said, if Arles wants to compete with similar style restaurants in Amsterdam, like Choux, Guts & Glory, BAK, and Gebr. Hartering, the cooking needs to improve.